Strategy, at its heart, is about choice. Few companies succeed by making a single big bet. Most winning strategies are based on a bundle of choices about, among other things, the customers to serve, the scope of the business, product offerings, and capabilities that interact with one another to help a company make money. Consider Trader Joe’s Co., the U.S. grocery retailer based in Monrovia, California. It focuses on educated, health-conscious customers, which influences where it locates its stores, which products it stocks, and the type of employees it hires. The company’s choices reinforce one another to increase customers’ willingness to pay, reduce costs, and thereby drive profitability. The dense interdependencies among the choices prevent rivals from imitating Trader Joe’s winning strategy. Piecemeal imitation of a few elements – for example, the store format or the focus on private labels – wouldn’t work. Instead, a rival would need to replicate the full set of interconnected choices. Strategy is inherently complex. We see this in the thick reports and complex frameworks that companies use to describe their strategic choices and how they connect with one another. Describing a strategy favors complexity, but executing it requires simplicity. To influence day-to-day activities, strategies need to be simple enough for leaders at every level of the organization to understand, communicate, and remember – a strategy that gathers dust on a shelf is nothing more than an expensive bookend. A strategy for execution must provide concrete guidance while leaving managers with enough flexibility to seize novel opportunities, mitigate unexpected risks, and adapt to local conditions. The act of codifying past choices into an explicit strategy, moreover, reinforces historical commitments and locks a company into inertia. Complex strategies, particularly those that include detailed plans, tend to be long on guidance but short on flexibility. How can leaders translate the complexity of strategy into something simple and flexible enough to execute? Your first instinct might be to boil a complex set of choices down to a handful that matter the most. Indeed, a series of strategy experts have argued that managers should do just that by distilling their strategy to a concise statement (less than 35 words) summarizing a few core choices. The strategy distillation approach hinges on a few fundamental strategic categories – such as the choice of target customer or core competencies – that can summarize the heart of any company’s strategy. 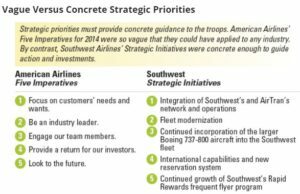 The authors illustrate this approach with strategies they have inferred from observing what has worked in the past at successful companies such as Southwest Airlines Co. or Ikea. We have learned, however, that this approach works best with companies that have relatively straightforward strategies to begin with. Part of our research on strategy execution included a four-year action research project in which we worked with top management teams of eight to 12 companies per year in formulating strategies for execution. The teams used a framework that boiled down their company’s strategy to three elements: target customers (who), the value proposition (what), and how the company would deliver, sell, and distribute products or services (how). The approach worked well for a subset of the companies, including a low-cost regional airline, a single-format retailer, a restaurant chain, and a producer of steel girders. Although operating in different industries, the companies shared three characteristics: They focused on a single business, offered a standard value proposition to a clearly identified customer segment, and their strategy was stable over time. Distilling a strategy into a few core choices sounds great in theory, but often derails in practice. You might think the issue was the specific framework we chose, but the roots of the problem go much deeper. To differentiate a company from rivals, the strategy should be specific to the company’s history and context, which implies the list of potentially strategic choices is long. Any short list of essential factors is likely to exclude choices that are critical to some companies. To be clear, this critique is not meant to devalue the work of the strategy scholars who created these frameworks, but rather to underscore the difficulty of reducing the inherent complexity of strategy into simple statements. Many companies simply cannot cram 10 pounds of strategic complexity into a three-pound bag. Many complex organizations that compete across multiple industries, product lines, and customer segments rely on strategic priorities to advance strategy. More than two-thirds of S&P 500 companies, for example, published explicit mid-term objectives intended to help implement their strategy. Limit the number of priorities to a handful. Restricting the number of strategic priorities to three to five has several advantages. Most obviously, having a small number will be easier to understand, communicate throughout the organization, and remember. Rather than overwhelming employees with the full set of all choices and interdependencies that make up a company’s strategy, communicating a few strategic priorities can focus attention, effort, and resources on the things that matter most now. The best priorities serve as strategic guardrails. If they know the parameters they must work within, managers and employees can fill in the blanks based on their local knowledge and circumstances. Focus on mid-term objectives. Strategic priorities act as a bridge between long-term aspirations – embodied in a vision or mission – and annual or quarterly objectives. The types of initiatives that have the biggest impact (for example, building data analytics capabilities, integrating online and physical stores, or entering a new market) typically take a few years. Of course, there are exceptions: A financial turnaround, for example, would require an immediate focus on short-term cash generation and debt reduction. But in general, we’ve found a good rule of thumb is “three to five in three to five” – three to five strategic priorities that can be accomplished in three to five years. Once you’ve set mid-term priorities, it’s important to stick to them. When a team announces five-year priorities and changes them a year later, employees dismiss those objectives (and their successors) as the “flavor of the month” that they can safely ignore. British fashion retailer Burberry Group plc offers a good example of staying the course. When Angela Ahrendts joined Burberry as CEO in 2006, she announced five strategic priorities (including intensifying non-apparel sales, accelerating retail-led growth, and investing in underpenetrated markets) and selected quantitative metrics for each. Ahrendts stuck with the priorities for seven years, updating employees and investors regularly on progress against each goal, which reinforced the message and the company’s commitment to achieving those objectives. During this period, Burberry’s share price handily outperformed competitors and the broader market. Pull toward the future. Strategy should guide how a company will create and capture value going forward, rather than codifying how it made money in the past. In dynamic markets, ongoing success typically requires innovation and change. The things that position a company for the future – for example, entering unfamiliar markets, building innovative business models, or developing new capabilities – differ from business as usual. Both are critical, but they often pull in opposite directions. Maintaining a healthy balance between the status quo and innovation is hard work. Well-oiled capabilities, established resources, organizational structure, metrics, and rewards favor a company’s legacy business, and employees will naturally default to activities that are familiar, straightforward, and produce predictable results. Keeping the trains running in the core business is necessary for success, but these routine activities will usually take care of themselves without having to be prioritized at the corporate level. Striking the right balance between sustaining a legacy business and building for the future requires judgment – there is no cookie-cutter template for getting it right. To gauge whether things are in balance, we suggest leaders look at the mix of priorities in terms of those that support and refine the current business model (for example, cost reduction, operational excellence, serving current customers, extending existing products) versus the objectives that take the company in a new direction (for example, entering new markets, building digital capability, non-incremental innovation). Leaders can also ask how different the business would look in three to five years if they were to achieve all their objectives. 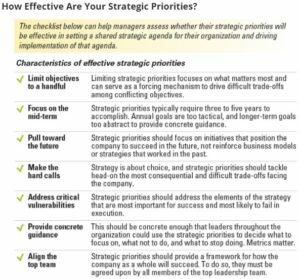 No mix of priorities is right for every company, but we have found that leadership teams that don’t examine their strategic priorities tend to overweigh business as usual. Make the hard calls. Apple Inc. CEO Steve Jobs often stood at a whiteboard during strategy retreats and personally led discussions among the company’s top 100 leaders to set strategic priorities. The assembled team would generate a long list of possibilities and after much wrangling and discussion, they would whittle them down to a rank-ordered list of 10, at which point Jobs would strike out the bottom seven to ensure the company focused on the most critical priorities. In organizations of any size, there will be dozens or hundreds of competing and often conflicting priorities. The discipline of honing priorities down to a handful can force a leadership team to surface, discuss, and ultimately make a call on the most consequential trade-offs the company faces in the next few years. When executives make the hard calls and communicate them through the ranks, they provide clear guidance on the contentious issues likely to arise when executing strategy. But making trade-offs among competing priorities is difficult – they are dubbed “tough calls” for a reason. Prioritizing different objectives results in “winners” and “losers” in terms of visibility, resources, and corporate support. Many leadership teams go to great lengths to avoid conflict, and as a result end up producing toothless strategic priorities. 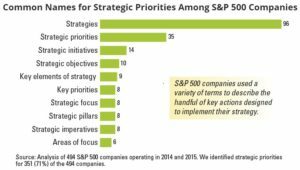 A common way to avoid conflict is to designate everything as “strategic” – one S&P 500 company, for example, listed a dozen strategic objectives. Another way leadership teams resist making difficult calls is by combining multiple objectives into a single strategic priority. A large retailer, for example, listed six key business priorities. So far, so good, but when you dug into the so-called priorities – “focus on the fundamentals of the business,” for example – the apparent discipline proved illusory. “Focus on the fundamentals” included, among other items, inventory management, cost cutting, customers, product categories, in-store experience, execution, speed, agility, lead-time reductions, and developing and retaining staff. If leaders dodge the hard trade-offs, their priorities provide little useful guidance to the troops. Address critical vulnerabilities. Even when you recognize the importance of making the hard calls, it’s often difficult to know where to focus. Strategy is inherently complex and the sheer number of possible objectives can overwhelm teams. So how can executives move from a complex strategy to a handful of strategic priorities? A key insight comes from military strategists, who have long acknowledged the complexity of armed conflict. Military planners often visualize the field of operations as a complex system of enemies, allies, infrastructure, popular support, and other features that collectively influence who wins and who loses a war. They then hone in on the so-called “centers of gravity” – the parts of the system that are both critical to the enemy’s success and most vulnerable to attack. Business leaders can deploy a similar approach by identifying the “critical vulnerabilities,” the elements of their own strategy that are most important for success and most likely to fail in execution. In for-profit organizations, pinpointing the most important actions means thinking through – and, ideally, quantifying – how the objective would help create and capture economic value. How much would a potential priority increase customers’ willingness to pay? How much would it decrease costs to serve target customers? How much would a priority deter new entrants or competitors by building a moat around the fortress? What new revenue streams would a proposed objective open up? Some elements of a company’s strategy – for example, a well-known brand or well-honed capabilities – will be critical to success but may not require sustained attention or investment. While important, these may not be priorities. Instead, companies should prioritize initiatives or activities that are at the greatest risk of failure without the sustained focus and investment support that strategic priorities can provide. When identifying critical vulnerabilities, it’s important to look at both the elements of strategy that are at risk due to external factors (such as shifting customer preferences, disruptive technologies, or new entrants) and internal challenges (need for culture change, organizational complexity, or need to build new competencies). Rather than relying solely on financial targets, leaders should start with the key actions required to execute their strategy, and translate these into metrics that provide concrete guidance on what success would look like. 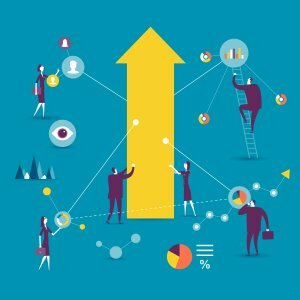 By tracking progress against metrics, leaders can maintain a sense of urgency over the months or years required to achieve the goal, identify what’s not working to make midcourse corrections, and communicate progress along the way – even before financial results are in – to keep key stakeholders on board. Align the top team. Unfortunately, lack of agreement on company objectives is fairly common among top teams. As part of our research on strategy execution, we surveyed more than 10,000 managers across more than 400 organizations. 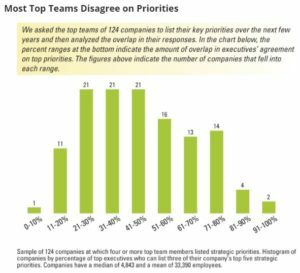 When asked how closely members of their company’s top executive team agreed on key priorities, nearly one-third said senior executives focused on their own agendas or that there were clear factions within the top team. The reality is actually worse than the survey results suggest. In addition to asking senior executives if they agree on the company’s priorities, we asked them to list their company’s key priorities over the next few years. 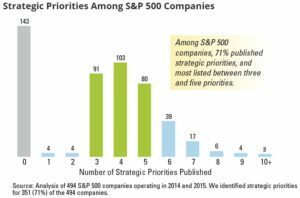 In the typical company, barely half of the executives voiced the same company-wide priorities. Indeed, in terms of shared strategic priorities, we found that two-thirds of the top executives were on the same page in just 27% of the companies we studied – hardly a recipe for successful execution.